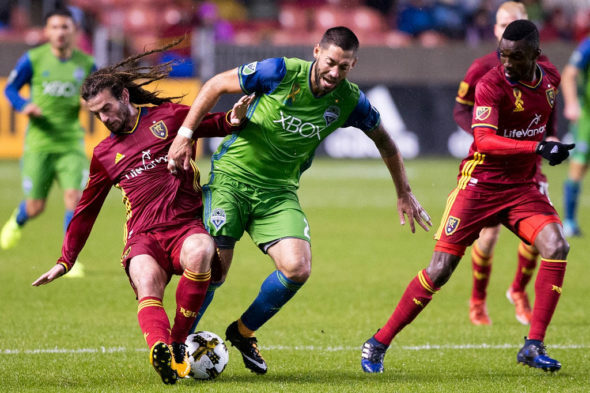 The Sounders had their unbeaten run stopped cold after 13 matches Saturday night in a 2-0 loss on the road against Real Salt Lake. Seattle (11-7-11, 44 points) made just one change from its 0-0 draw on the road against FC Dallas Sept. 16, inserting Victor Rodriguez at left midfield in favor of Joevin Jones. Still, the attack became predictable, with the ball running through the middle of the park to Clint Dempsey and Nicolas Lodeiro, who were too close to one another to find any effective openings. To compensate for the congestion in the middle, left back Nohou Tolo was often in an advanced position up the field, which cost Seattle on counterattacks that found RSL’s 20-year-old Jefferson Savarino in the right alley. The Venezuelan prodigy finished with a goal and an assist to Luke Mulholland for the second strike of the game, both arising from opportunities after costly Seattle turnovers. Savarino notched the game-winner in the 52nd minute, slotting a shot on the ground across the face of goal after catching Tolo exposed on the right side. Savarino served in the second goal in the 66th minute, after a wide through ball stretched Seattle’s back line and allowed Mulholland free space inside the six-yard box. Mulholland easily finished the ball past a frozen Stefan Frei. Head coach Brian Schmetzer acknowledged the breakdowns. Seattle mustered two good chances on goal, but failed to convert. About 80 minutes in, Kelvin Leerdam found Dempsey in front of goal with a cross from the right side, but the midfielder was unable to send his shot past a sprawling Nick Rimando. Dempsey failed to best Rimando in the third minute of stoppage time after quickly shooting a free kick toward goal, as Rimando remained alert in the confusion and stopped the ball just outside the right post. Ahead of a midweek clash against conference leaders and Cascadia rival Vancouver, Schmetzer’s reflection of Saturday’s failures was succinct as his team finished its fifth straight match without a win. “We need to finish chances,” he said. “We didn’t create enough consistent pressure. A lot of times we didn’t play with enough patience in the attacking half. The back line was playing catch up the entire match. I thought with Morris out that Lodeiro would step it up but that didn’t happen.